Elektra Azy of Marazy Cristal and Quark BaldEra had a litter of three kittens born on September 10, 2017: a hairless girl, a brush girl and a flock boy. Please visit the link above to see pictures of these kittens. Pictures of previous litters are also available. The Peterbald is a relatively recent hairless cat breed from St. Petersburg, Russia. 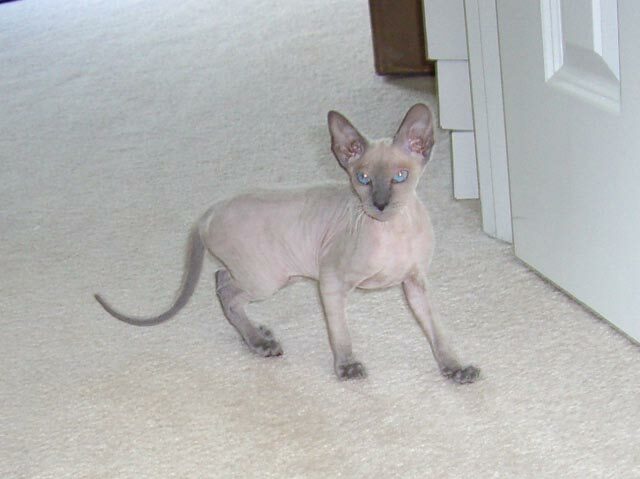 The breed originated as a cross between the Donskoy and Oriental Shorthair, demonstrating that the Donskoy's hair loss gene is dominant, unlike the recessive hairlessness gene in the Spynx. Peterbald cats are elegant, long and tubular with a long, whiplike tail. They do not have a pot belly like the Sphynx. They have long legs, oval paws, large, bat-wing ears and a wedge-shaped muzzle. Personality-wise the breed is affectionate, active and athletic. 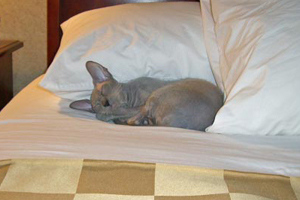 Blue Belle napping in the hotel room after a long day at a cat show. Flock. Flock cats are 90% hairless and feel like a smooth chamois leather to the touch, with no stickiness. They can be pet in either direction without resistance. Velour. Velour cats are 70% hairless and will have a coat of up to 1 mm in length. There is some resistance if you brush them the wrong way. 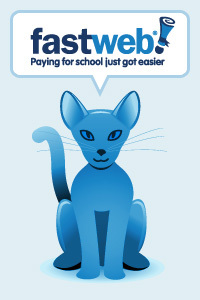 Blue Belle is Fastweb's spokescat. The coats may change as cats age. Blue Belle's mother was born with a brush coat and lost it as she got older. Blue Belle lost most of her brush coat during her first pregnancy. The cats feel warm like a hot water bottle because they lack insulating fur. Peterbald cats do not need to be bathed as frequently as the Sphynx, but should be bathed regularly. Peterbald cats are not hypoallergenic. About two-thirds of people who are allergic to cats react to allergens in the cat's saliva, not just the dander. However, the lack of fur and the need to regularly bathe Peterbald cats may reduce the intensity of the allergic reaction in some people. The breed was accepted by TICA in 1997 and recognized for championship status in 2005. TICA accepted the brush coat variety of Peterbald for championship status in May 2008. 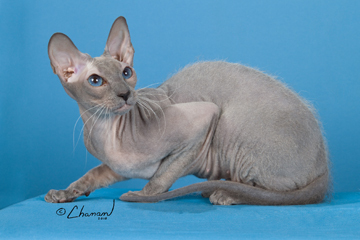 Blue Belle is one of the first brush coat Peterbald cats to achieve championship status. 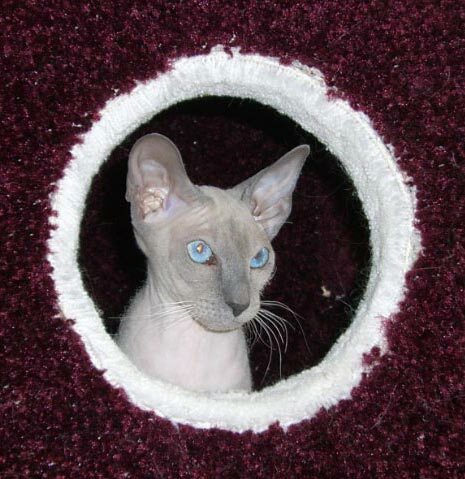 Blue Belle is unusual among Peterbald cats, as she combines a gray body color with brilliant blue eyes. The blue eye color is gene-linked with the blue-point characteristic and is not normally found in solid gray cats. Blue Belle is blue-point but with a gray body color. She was born white and developed dark gray points like all blue-pointed cats, as is illustrated in the left-hand picture. But as she got older, her body color turned gray, as is illustrated in the right-hand picture. Since then her points have faded to match her gray body color. The only exception is her tail, which is still somewhat darker than her body color. Blue Belle as a kitten with white body and dark points. Blue Belle after she began developing a gray body color. 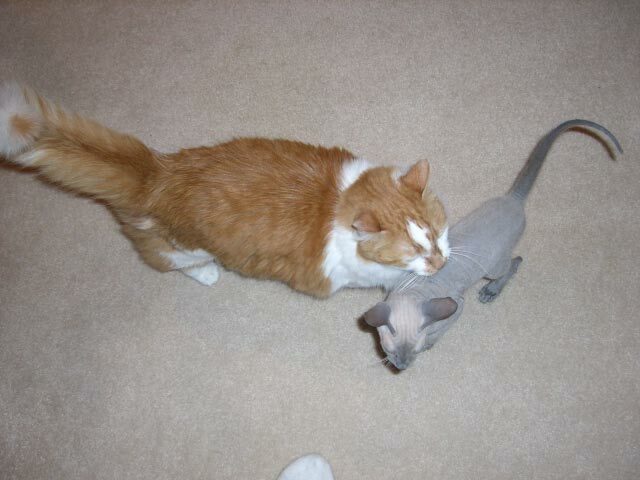 She is shown with Joto, a 12-year-old orange and white Munchkin. Since a blue-eyed solid gray Peterbald cat is spectacularly beautiful, we hope she will pass on these characteristics to her kittens. We are breeding Blue Belle exclusively with blue-point male Peterbald cats to maximize the chances of her kittens having the same characteristic.